Hopes of finding evidence of life on far off alien worlds by studying their atmospheric chemistry have been dashed by a new study that concludes it’s almost impossible. 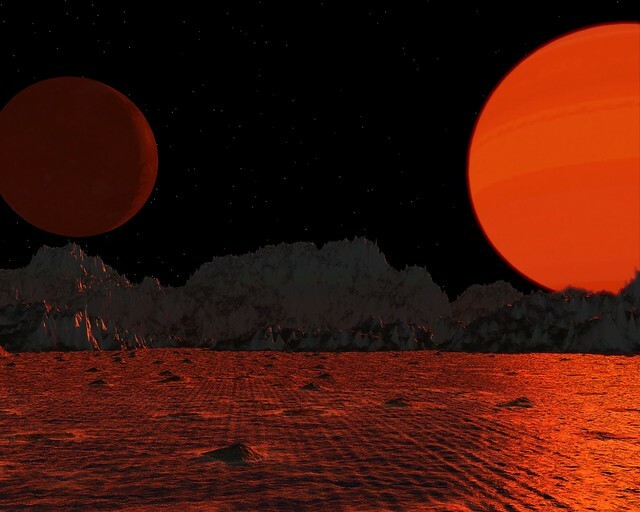 The study from the University of Toronto finds the method used to detect biosignatures on exoplanets can produce a false positive result. The presence of multiple chemicals such as methane and oxygen in an exoplanet’s atmosphere is considered an example of evidence of past or present life. Rein’s team discovered that a lifeless planet with a lifeless moon can mimic the same results as a planet with such a biosignature. “You wouldn’t be able to distinguish between them because they are so far away that you would see both in one spectrum,” Rein commented. The resolution needed to identify a genuine biosignature from a false positive would be impossible to obtain even with telescopes available in the foreseeable future, he said. Current methods can estimate the size and temperature of an exoplanet in order to determine whether liquid water could exist on the its surface, one of the criteria for a planet hosting the right conditions for life. To date, 1,774 exoplanets have been confirmed to exist, and there could be more than 100 billion planets in the Milky Way galaxy alone. Despite the results, Rein is optimistic the search for life on planets outside our own is possible if done the right way. Because your all stupid I found them in my backyard I can prove it anytime the world would like to know the truth.I can show you things pictures and videos that show that their here and there not going away anytime soon emagine that one guy in Texas over a couple of months made the discovery that would change everything and no one wants to know the truth I’m not just telling you I can show you !!! !